It’s been years since I learned an important restaurant lesson—one I will not need to learn again. Let’s call this a lesson to last a lifetime. I should have known better. Of all people, I should not have trusted a menu without prices on it. But for some reason, it just didn’t cross my mind that I needed to. Friends had called asking if we’d like to join them for dinner. It was spontaneous so they looked to me, their fearless cheapskate, to come up with just the right choice in restaurants. We were game to try something different, so armed with my trusty two-for-one Entertainment book, I led the way through the first 60 or so pages of this exhaustive resource. We eliminated the outrageously expensive and finally agreed on a Moroccan restaurant. The menu was printed right there in the book and indicated, “Dinners: $15 per person.” Knowing that we’d get four dinners for the price of two, we figured this was a pretty good deal and a good way to try something new, even if it turned out to be, well, gross. The “Valet Parking Only” sign should have been the first clue. Honestly, it ticked me off, which was not a good way to start off the evening. But I calmed down and we figured a couple of bucks to park wouldn’t kill us. It took a while for our eyes to adjust to the dark. I recall muttering something about “Do we really want to do this?” as we were led to our table, which was the size and height of a coffee table. The seating resembled very low “sofas,” not designed for sitting as much as for reclining. Trying not to laugh too loudly, we greeted our waiter who proceeded to introduce himself and then squatted down to join us. How cordial, I thought. He explained that we would be enjoying an eight-course authentic Moroccan meal without the aid of silverware. Gulp. It was too dark to read the menu, but I could tell there were no prices included. Curious. But we already knew it was $15 per person, so we graciously listened as he described every single detail of our meal to come. Armed with large fluffy blue napkins that resembled bath towels, we dove into the most delicious meal I believe, that to this day, I’ve ever eaten. As we put away the eighth course consisting of nuts, fruit, and mint tea, we kept marveling at the reasonable price (don’t forget we had discount coupons) and made tentative plans to return. The check was delivered to the table, but we were having such a great time we hardly noticed. When we did, it’s a miracle they didn’t have to call the paramedics. Our ultra-cheap $30-or-so-total dinner for four, without tax or gratuity, suddenly jumped to nearly $175 (this was quite a few years ago; imagine what that tab would be today). Sure they had $15 dinners (a piece of chicken, baklava, and tea). 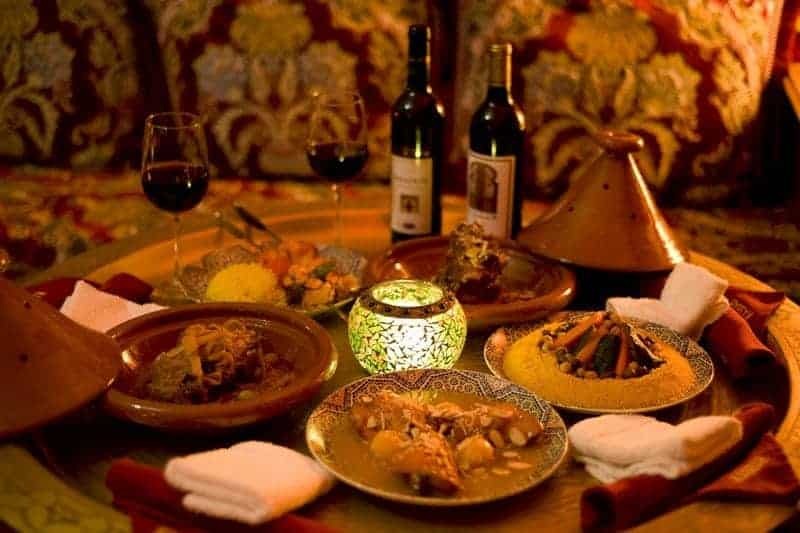 But the eight-course authentic Moroccan feast—the grandest of all, the authentic quintessential Moroccan experience—was way more than double that. To add injury to indigestion, our great two-for-one coupons were worth just $12 each. With tax, tip, and valet we got soaked. I can’t say that I regret the evening. We scraped together the full amount, ended up laughing over the experience and actually made plans to go back. And you can be sure I would order just the Bastilla*: $8.50 a la carte. I found a light and a menu with prices on the way out. *Look what I just found! A recipe for authentic Chicken Bastilla. That’s it! Can’t wait to give it a try as soon as I figure out the orange blossom flower water. PREVIOUSLY: 9 Great Reader Tips to Change Your Day for Good! Highly Useful Accessories are the Secret of Instant Pot Rockstars!